Citrix Receiver is a platform that allows enterprise users to launch commonly used applications from one centralized app hub. 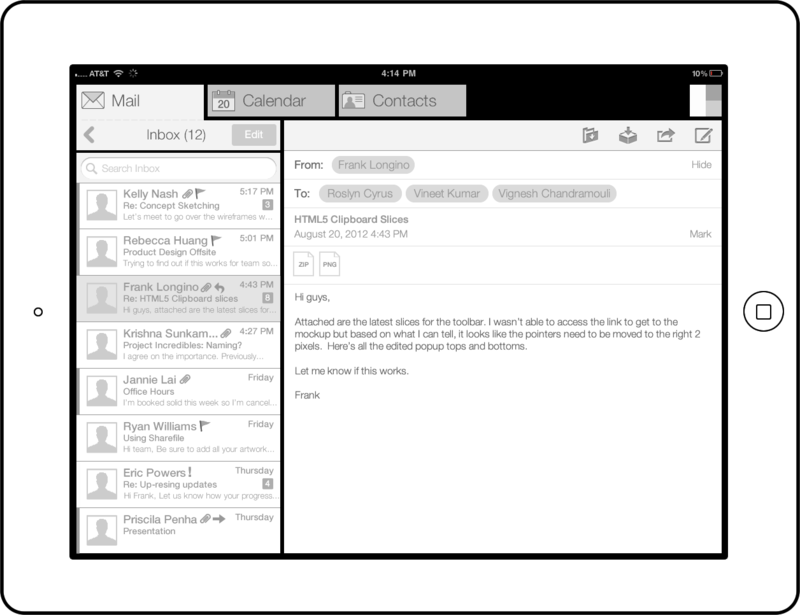 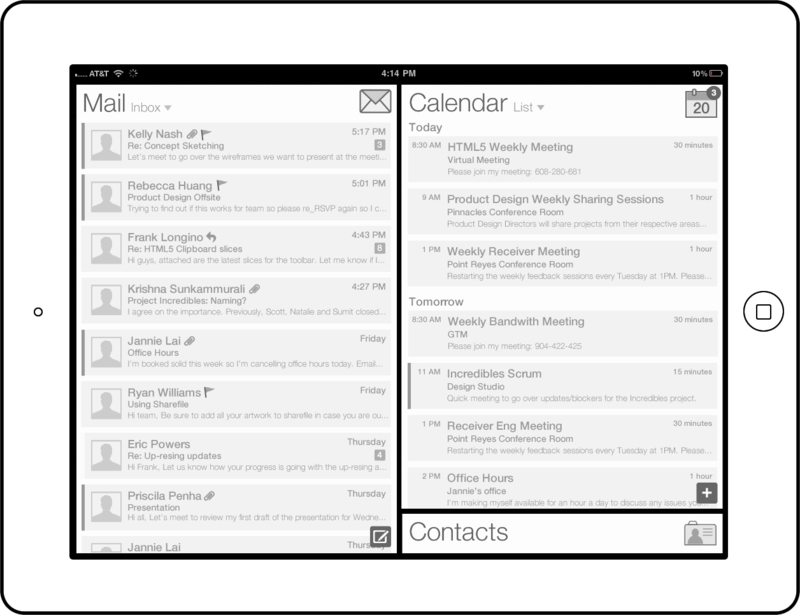 This is a concept for a Mail, Contacts, and Calendar iPad application that I designed while working for Citrix. 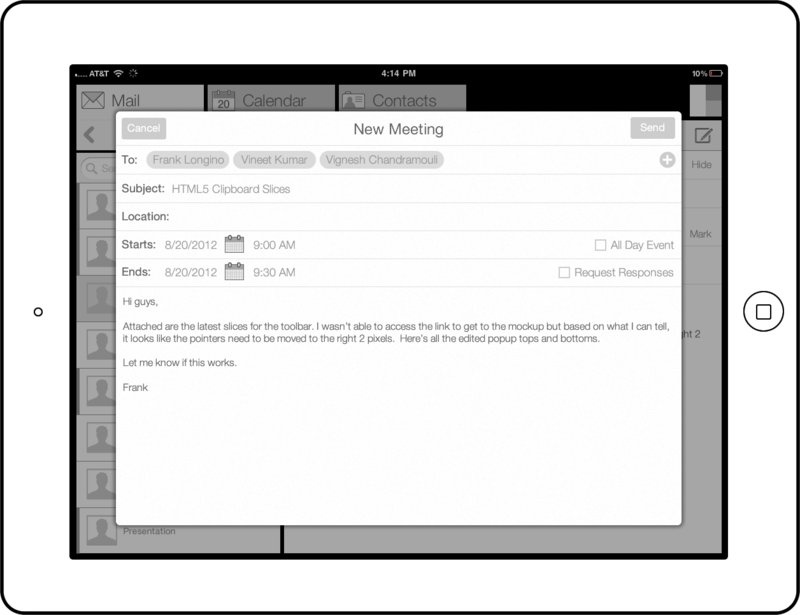 Users can quickly create an email, contact, or meeting by dragging and dropping from one widget to another. 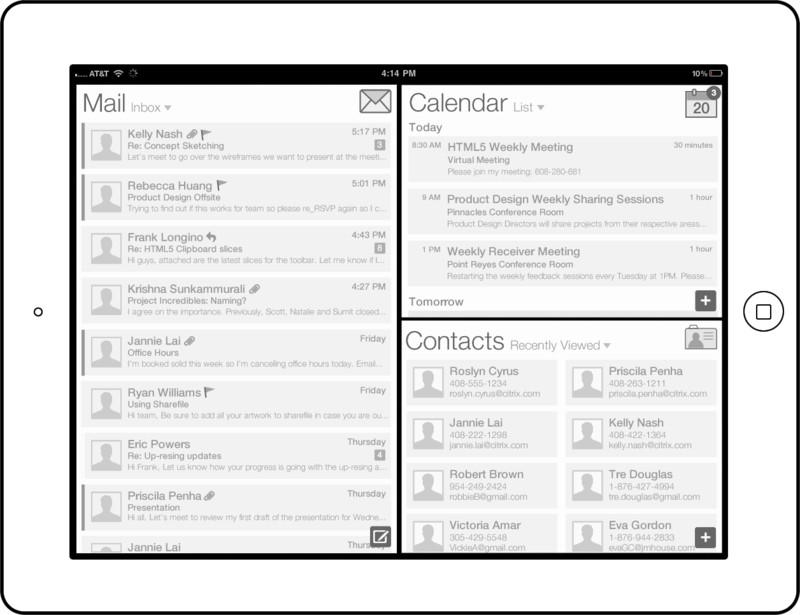 We needed to create a concept for an iPad app that could be launched from this hub to quickly allow users to access their email, contacts, and calendar. 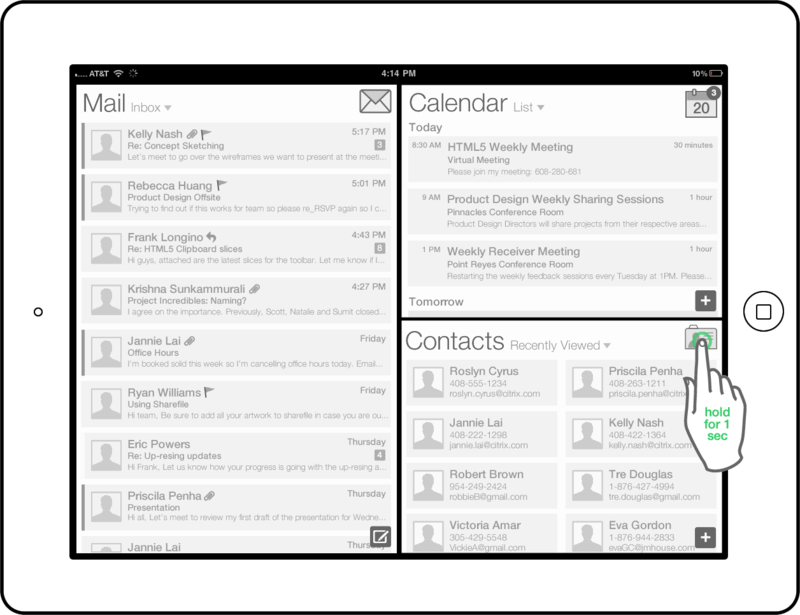 A few designers came up with a concept for such an app. 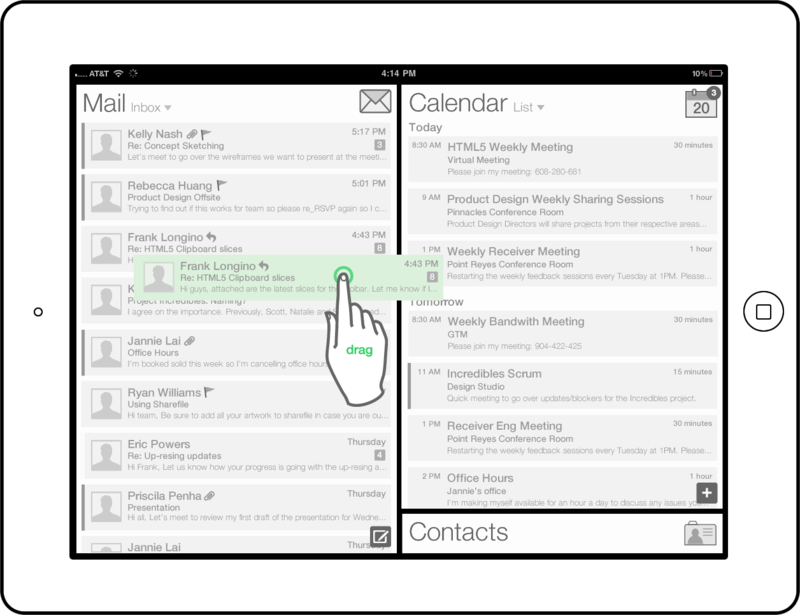 To encourage on-the-go users to easily access their communication data and create context, whether an email, a new contact, or an event.To create a user interface that would allow customization without complication. Simplicity and familiarity were important factors. 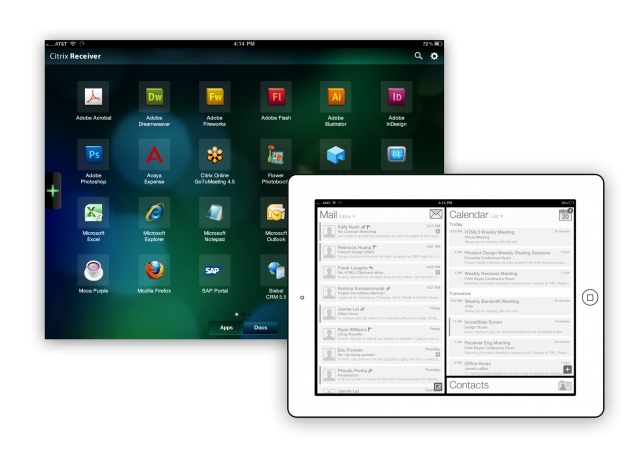 Landing page for iPad app. 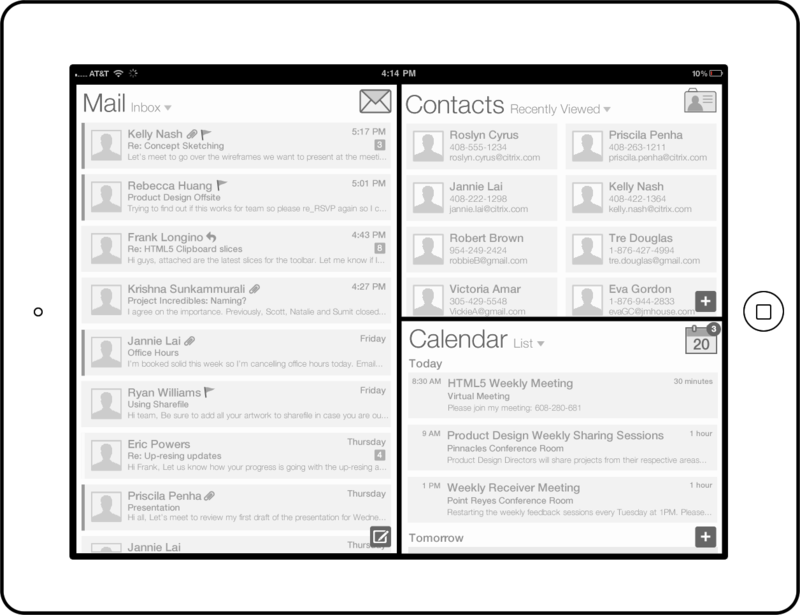 Mail, Calendar, and Contacts widgets are the features. 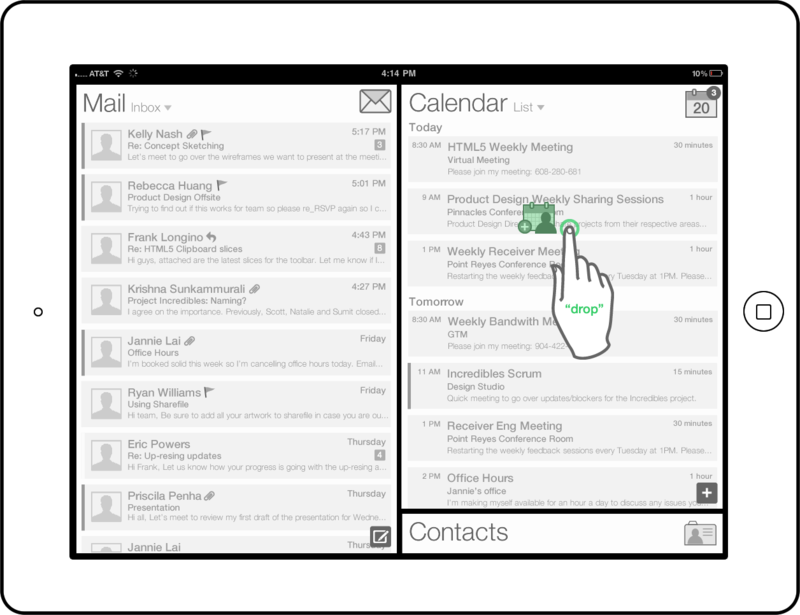 User taps the Contacts widget. 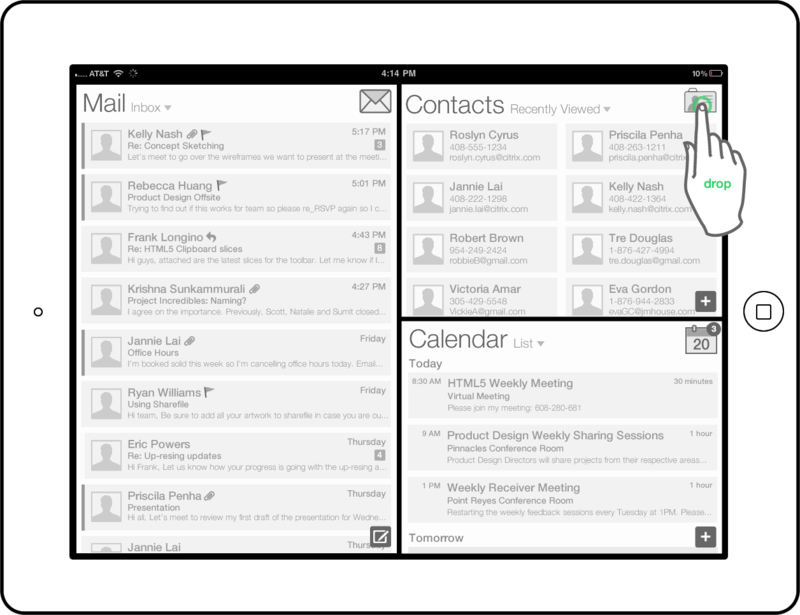 Contacts widget expands when tapped. The user can quickly view their data and customize their view. 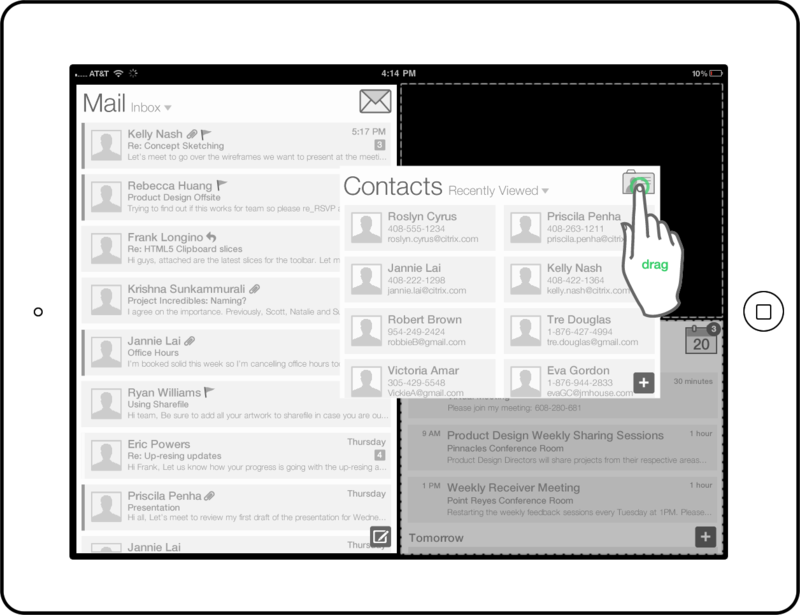 Content can be created by dragging an object from one widget to another. 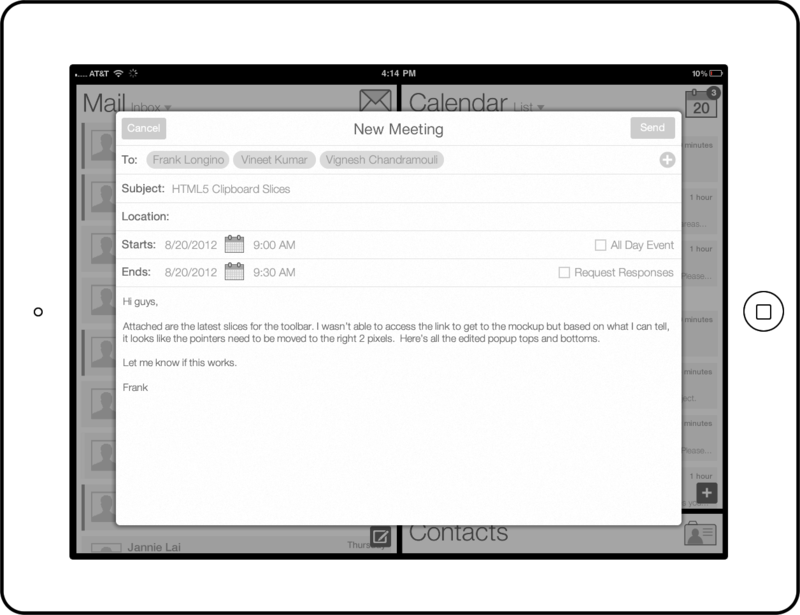 Dragging an email onto the calendar will create a new meeting with the email’s recipients invited. Dragging an event onto the email widget will create an email replying to all recipients. Dragging a calendar invite to the contacts widget will prompt user to add any meeting invitees that are not in the user’s contacts. 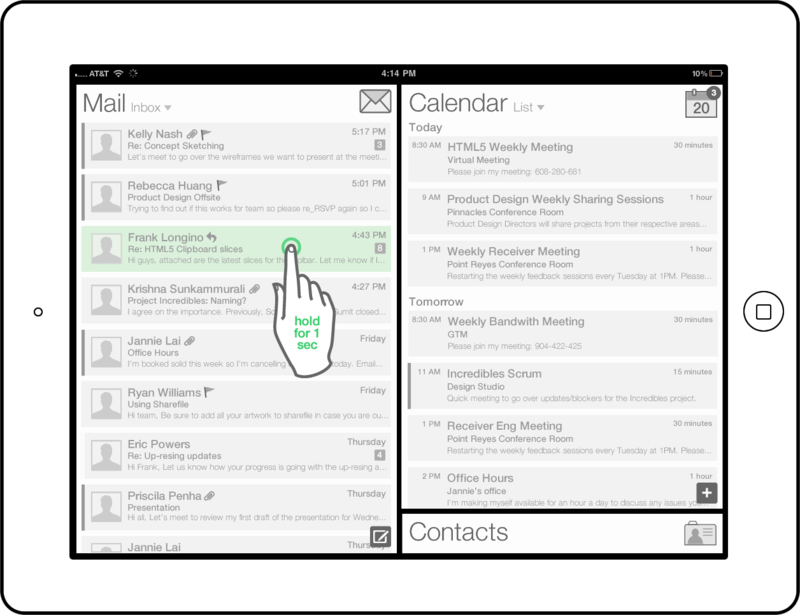 Dragging a contact to the calendar widget will create a meeting invite with that contact invited. Dragging a contact to the email widget will create a new message to that contact. Dragging an email to the contact widget will prompt user to add any email recipients that are not in the user’s contacts.